Can't attend? Follow Stratosphere to know of future events! 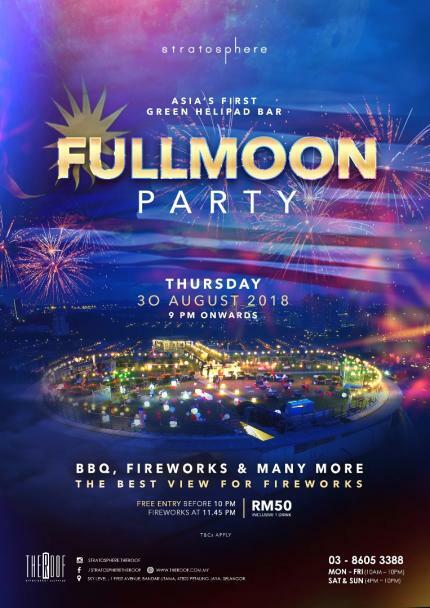 In order to celebrate the 61st Malaysia Independence Day, Stratosphere at The Roof is presenting Full Moon Party! Let's party “in the sky” on 30 AUG 2018 from 9pm on wards in Asia’s first and only green helipad bar with a 360 view of the city. Stratosphere at The Roof is the only one of a kind bar that is nestled thirty over stories above ground with spectacular views, enticing beverages and most definitely an impressive sound system that makes this place THE venue for a party like no other. Also, we are throwing the biggest party with the hottest DJ, fireworks show, BBQ and many more! Do not hesitate and get your ticket right now!